â—¼ Imminent Audio: Saying “Tuesday at midnight” or “Wednesday at midnight” can mean different things to different people, so to be clear: On the midnight when Tuesday, November 20, meets Wednesday, November 21, I will be guest DJing for two hours on the web-streamed radio show “The World of Wonder” on KUSF in Exile. Thanks to drum machine innovator Matt Davignon for inviting me to handle the duties. 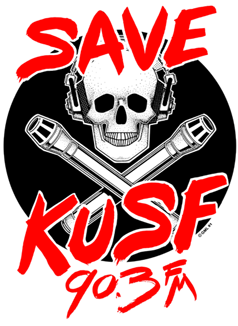 It will stream at savekusf.org. The show will emphasize various aspects of minimalist sound: quietude, rhythmic simplicity, texture, and more. And that’s Pacific Time. And it will be archived within a day of the broadcast, and I’ll post that here when it’s available. The show includes music from, among others, Dance Robot Dance, Emma Hendrix, Garth Knox, Kate Carr, Anton Lukoszevieze, Scanner, all n4tural, Natalia Kamia, and jmmy kpple. â—¼ Two Disquiet Concerts: More on these very soon, but if you’re in Manhattan or San Francisco, please note that Disquiet Junto concerts are coming your way, soon. The Manhattan show will be at the gallery apexart on November 27, a Tuesday, at 6:30pm. The lineup: Brian Biggs (aka Dance Robot Dance), Ethan Hein, Shawn Kelly (aka Whyarcka), Kenneth Kirschner, Tom Moody, and Roddy Schrock (with Joon Oluchi Lee). The theme will be mechanized music made from field recordings of retail spaces, as part of the “As Real As It Gets” exhibit, organized by Rob Walker. â—¼ The San Francisco show will be at the gallery the Luggage Store on December 6, a Thursday, at 8:00pm. The lineup: Cullen Miller, Clarke Robinson, Jared Smith, Subnaught, and Andrew Weathers (see facebook.com). The theme is yet to be announced. First, a shuffled play of Brian Eno’s ambient albums, such as Music for Airports; second, an ingenious iPod app Eno made called Trope. You tap and rub the screen for a moment, fingerpaint-style, to set the texture for a Music for Airports-like ambient soundscape that will play indefinitely. I’ve done some great planning and some of my better writing lately with that going. The one danger is that the fine ambience and healthy relaxed Zenlike state it produces can convince you you’re getting good work done when it turns out … well, you’re not. A couple times I fell asleep. I was sitting in my seat, listening to music at a moderate volume on headphones and writing on my laptop, when the man across the aisle — the kind you’d peg as an archivist or musicologist — signaled to me. After each reproach they would lower their voices for a while, but like a grade-school cafeteria after the lunch monitor has yelled for silence, the volume crept inexorably up again. It was soft but incessant, and against the background silence, as maddening as a dripping faucet at 3 a.m.
For the record, as I’ve said in the past, I think perceiving this matter of “noise versus silence” as a fight is part of the problem. Noise is metaphor as much as it is a visceral experience. Noise is, in many ways, antagonism — and a fight is often a matter of antagonism, whichever “side” you’re on. Studies have shown that conscious thought takes place at about the same rate as visual recognition, requiring a significant fraction of a second per event. But hearing is a quantitatively faster sense. That’s from his recent (and widely circulated) essay “The Science and Art of Listening” from the New York Times. Horowitz is the author of the excellent book The Universal Sense: How Hearing Shapes the Mind. Like Kreider above, Horowitz is concerned about the pressures of modernization on the senses (“Listening is a skill that we’re in danger of losing in a world of digital distraction and information overload”), but he is more attuned to the role context and consciousness plays: “your brain works like a set of noise-suppressing headphones,” he says. He argues in part for listening as a skill an individual can acquire, in contrast with the more systemic approach that Quiet Car devotee Kreider seems to be aiming for. I think the waveform could be of use in a future Disquiet Junto project — read it as a graphically notated score, like we did the polling data from the recent U.S. presidential election. I want the audio to take on a life of its own, to be constantly pulsing and shifting. I love contrasts as well, beautiful sounds hidden by noise, things like that. I’m at a strange place at the moment because my sound seems to be more and more influenced by religion, which is funny as I consider myself an atheist. I think its their sense of “epic”that inspires me. Big spaces and big bombast. It started when I was staying at a friends house in Budapest a couple of months ago. On Sunday morning this huge sound woke me up. His flat was next to St Peters Basilica and the sound was the bells tolling. It was so intense, but beautiful at the same time. I’ve recorded in churches in the past and this is something I’d like to do more of, although sadly it’s not easy finding one that’s sympathetic to ambient music. â—¼ Tech-nique: Mark Rushton continues to report on his use of Google Hangouts, and in this case on his employment of a newly popular iOS app, Samplr. â—¼ Math Tip: If you’re trying to add lengths of various tracks (e.g., combine the length of a handful of songs when estimating the length of a planned podcast), this is a handy tool: dollartimes.com. â—¼ Surreal Politik: Old news, but nonetheless: the irony when a political campaign doesn’t fully comprehend the provenance of its source music extends beyond the opposition by pop stars to staples of the American classical repertoire: theatlanticwire.com. â—¼ Sonic Diptychs: The great youtubemultiplier.com site was introduced to me by the talented and insightful Samuel Landry, and since his initial mention I’ve seen and received many others. The service lets you easily play two or more (up to eight) YouTube videos side by side, simultaneously. The previous link goes to a Landry (aka @le_berger on Twitter) cocktail of Steve Reich, Arvo PÃ¤rt, and Stephan Mathieu. The service is wonderful if only for letting me now, whenever I want, play one of my favorite sonic diptychs: Brian Eno’s Thursday Afternoon + DJ Krush’s Kakusei. It’s been tremendous to watch Paul Lamere‘s Infinite Jukebox get covered so widely. 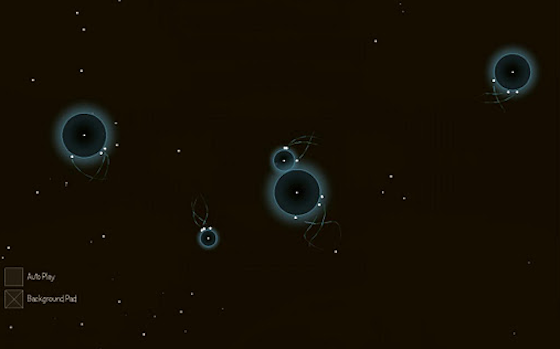 Brian Eno’s widely reviewed recent Lux album is getting rightful credit for bringing the concept of generative sound (back) into public view, but Lamere’s Jukebox is doing so not through the alternate backdoor aesthetic of ambient music, but right through the front door by employing standard pop songs as its source material. The Infinite Jukebox web application takes an individual song (feel free to upload your own) and creates an endless version by breaking it into segments and locating “pathways” that can be linked to each other in an ever-changing, random sequence. I don’t have much to add on it at the moment except: (1) I think the major pleasure of the project may be how it replicates how our memories actually play back songs in our heads: not as pristine or even “worldized” recordings, a la Dennis Potter (The Singing Detective) or Walter Murch (American Graffiti), but as snatches that replay at an inconsistent pace and with varying attention to specific elements; (2) I am intrigued by the copyright ramifications — how do you bill/charge or otherwise claim royalty payments for such usage; (3) in my experience you can glitch up the Infinite Jukebox by playing it in a Chrome browser tab that isn’t the front-most tab; this causes the tune to skip, or in contemporary parlance, to enter an especially narrow, recursive pathway; and (4) do start using it: at echonest.com. 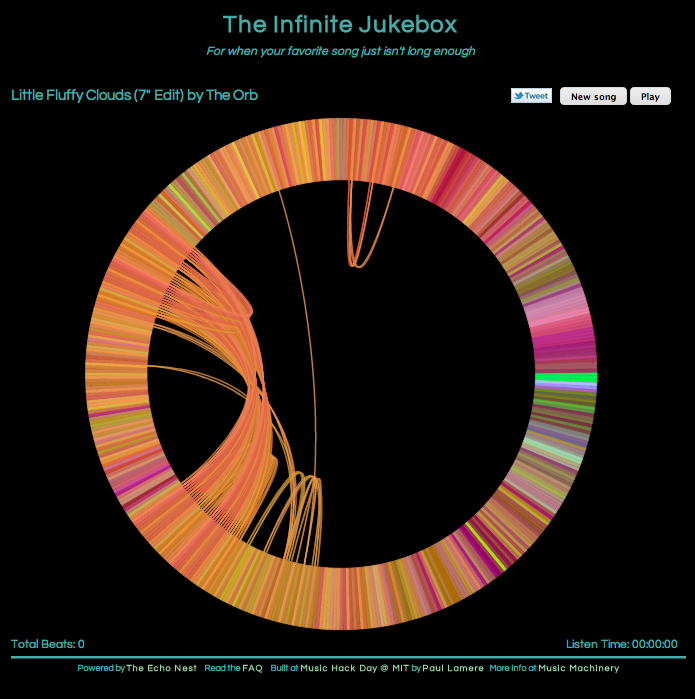 The Infinite Jukebox was developed by Lamere, who is Director of Developer Platform at Echo Nest. More on it at his musicmachinery.com website. And speaking of which, there’s was a great feature on the company in a recent issue of Fortune (PDF) by Rob Walker, who organized the current “As Real As It Gets” exhibit at apexart in Manhattan, for which the Disquiet Junto provided sound design. Â¶ Download Before It Expires: The flagship RjDj app of the London-based Reality Jockey firm, home to the Inception and Dark Knight Rises Z+ apps, will no longer be available shortly. It is highly recommended that you download RjDj from the iTunes app store now for your iOS device before the app is retired. Details on the decison at the company’s blog, at rjdj.me. The post mentions that the company’s website will be relaunched on Monday, October 8. Â¶ Android Play Pretty Some Day: The website androidmusician.com is a solid compendium of sound/music apps for the Android operating system. It does a much better job than the Play store of displaying the state of tools for such activity. It’s more product-specific than the more cultural/newsy palmsounds.net, and complements it well. The site also has a presence at twitter.com/androidmusician. It’ll be interesting to observe, over time, how these app-discovery services function best, whether the users will congregate at sites focused broadly on OS-specific coverage (Android versus iOS, etc. ), focused broadly on usage-specific coverage (music, productivity, fitness), or as is the case of androidmusician.com focused at the intersection of a specific OS and a specific user base. Â¶ Boinquarius: One of the best music publications about adventurous sounds is the weekly email newsletter of the San Francisco record store Aquarius. The store is located on Valencia Street, not far from such cultural epicenters as the Borderlands science-fiction bookshop and the McSweeney’s pirate store. Aquarius’ newsletter, which usually pops up in email boxes on Friday evenings, has hooked up with the great Boing Boing (boingboing.net). The latter will be publishing one review per day, culled from Aquarius’ loquacious and knowledgeable crew, who are major fans of Krautrock, experimental electronics, and the darkest of death metal, among other things. Here’s a taste of what’s to expect, a review of the Common Eider, King Eider DVD Sense of Place: “wheezy chordal whirs, the vocals layered and wreathed in echo and reverb, a mysterious chorale that instead of building and then fading out, remains somewhat constant, with different voices receding and resurfacing, each part of the music slipping easily from just organ, to organ and voices, making for a constantly shifting landscape of muted melody and vocal texture.” Visit Aquarius Records (online) at aquariusrecords.org. Â¶ Sonoma Sound Art: If you’re in the North Bay (and, that is, if the Bay is the San Francisco one), be sure between now and October 14 to take the time to visit the art gallery on the Sonoma State campus, which is currently showing Sound, Image, Object: The Intersection of Art and Music. The participating artists are Mauricio Ancalmo, Terry Berlier, John Cage, Brian Caraway, Chuck Close, Bruce Conner, Lewis deSoto, Chris Duncan, Jacqueline Kyomi Gordon, Victoria Haven, Robert Hudson, Christopher Janney, Paul Kos, Tom Marioni, Jack Ox, Sarah Rara, Steve Reich, Isabelle Sorrell, Alice Wheeler, and William T. Wiley. Indeed, quite a lineup. I hope to have time to write it up soon. The Reich are a pair of early compositions, including “Clapping Music”; the Ox a set of visuals combining sheet music and architecture drawings (above right); the deSoto a suspended stereo console; the Duncan an LP record made of paper (above left). A tremendous show. The above is a recording by Sowers of Flavin’s buzz. On Wednesday, September 19, there’s a panel discussion in San Francisco at the Grey Area Foundation for the Arts on “Alternative Musical Interfaces,” and I’ll be serving as moderator. The panelists include the highly talented trio of Michael ZbyszyÅ„ski (mikezed.com), Peter Nyboer (see his bayimproviser.com entry), and Spencer Salazar (see his ccrma.stanford.edu page) —Â more on whom at gaffta.org. It’s all under the auspices of GAFFTA’s Sound Research Group. GAFFTA is located at 923 Market St, Suite 200, which is between 5th and 6th Streets. The event runs from 7:00pm until 8:30. Tickets are $20, but GAFFTA has a solid “no one turned away for lack of funds” policy. We’ve seen many shifts in ways to control sound over the millenia; everything from animal skins and bones to hacked Game Boys and everywhere in between. We find ourselves positioned at an interesting point in time for how we manipulate sound in a post-instrument world. The topic of alternative musical interfaces has been discussed by those attempting to redefine how we’ve shaped sound since the tribal era, but the discourse seems to be thriving. We’ve brought together three specialists (see below) who have dedicated large portions of their lives to the noble task of constructing new musical interfaces and pushing musicians to interact with their instruments in new and different fashions. The object of this evening is to gather together those interested in redefining our physical relationship to sounds and music. If you are interested in audio we recommend that you come join in the discussion with us.